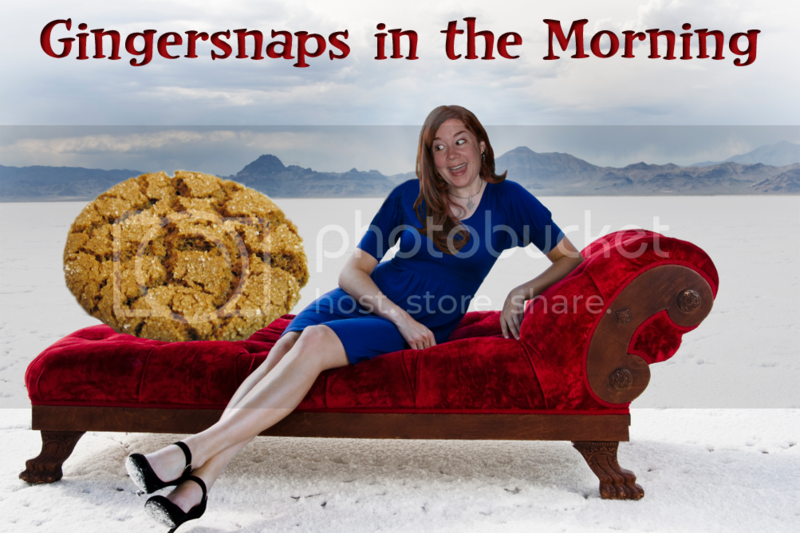 Theatrical Thursday to you all, my little gingersnaps. This is like a little family, isn't it? I think it is. So talk to me. Am I following you on twitter? If you're a regular reader and follow me on twitter, and I'm not following you back, leave a comment with your twitter name and I'll follow you. 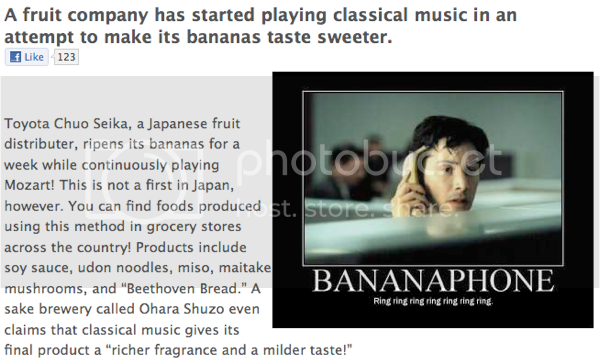 Wow that was a fantastically awesome run-on sentence. I'm skilled that way. But I'm serious. Let's get to know each other better. I've already told you so much about myself. Your turn. I'll go ahead and move on to the weather while you're thinking about what you're gonna say. The weather in John Catch A Cow, Pitcairn Islands is 77 degrees with a chance of rain today. How in the heck did they come up with that name? Did John catch the cow, or was that a mandate he was supposed to follow? And who is John? And where is the cow now? And what did John do after he caught the cow? One place you have no hope of catching the cow is on the 405 this morning, cause you'll be stuck in your car in the bumper to bumper traffic. Unless you think hamburger counts as "the cow" and then you can always pick one up before you get on the 405. In the news, a man hated spam (email, not the meat product) so much, he quit his job as a marketer to go to law school and now makes his money suing spammers who violate anti-spamming laws. He makes enough in settlements and judgments to support himself, having accumulated 1 million dollars from spammers. Apparently he was not interested in enlarging his breasts. I say, keep at it, Daniel Balsam. Are you by any chance hiring? 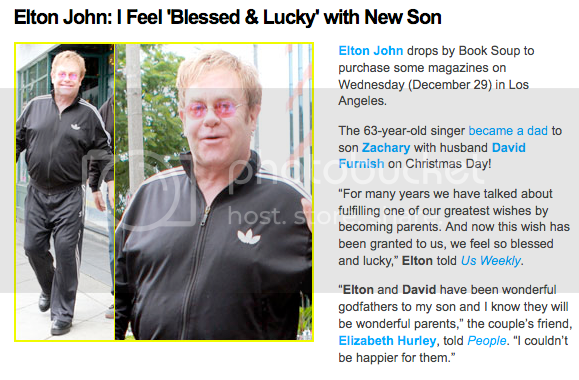 Elton John and his partner David Furnish have become parents to a baby boy via surrogate. They've named him Zachary Jackson Levon Furnish-John. Congrats to the new parents, but uh... I'm having trouble visualizing two old dudes (ages 63 and 48) as first time parents. Are either of them gonna change the diapers? Probably Maria the nanny will. Hey, that's wrong and so stereotypical. Not all Mexican nannies are named Maria. 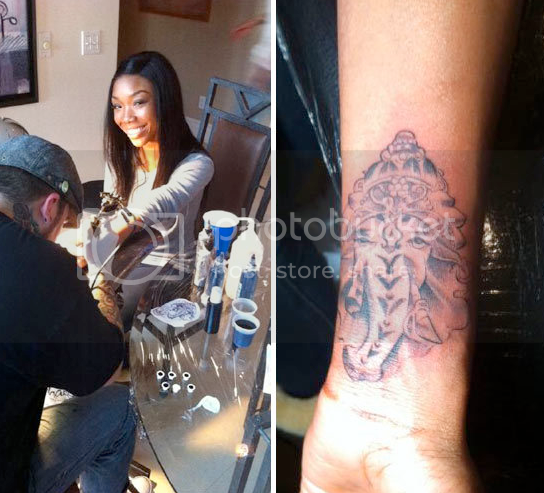 In other celebrity news, singer Brandy got a tattoo of a uncircumcised hee haw Hindu elephant on her forearm. Hmmm.... that doesn't look anything like the elephants I've seen on the Discovery Channel. Kelsey Grammer is trying to speed up the divorce from Camille Grammer, his wife of 13 years, so he can marry his new girlfriend. Apparently he doesn't learn from past mistakes because while he had no pre-nup with Camille (who stands to get 50 million in the divorce), he has no plans for a pre-nup with his new wife either. Hey, it's his money. Actually no, it's Camille and Kayte's money. That is absolutely hideous. You can't possibly tell me that shirt and skirt go together. I love your daily assignments, they are always good for a laugh. Im not into twitter so I dont follow anyone..lol But I do follow this blog, everyday, even if I dont leave a comment. Love it! Always brightens my day! You already follow me, Miss Ginger!! Yay!!! 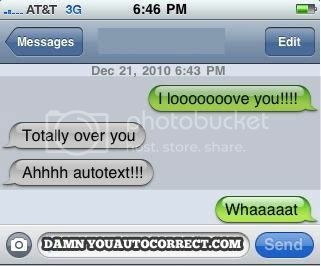 The autocorrect is supposed to say "totally love you". atleast that's what the guy is insisting, LOL. 1. I don't twitter. I barely even blog and only sporatically FB, so I am not sure I can keep up with twitter. 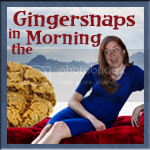 But if YOU tell me to twitter, Ginger, I will strongly consider it. 2. Obviously, by Maria the nanny, you meant Maria the Austrian singing nanny who will one day end her nun aspirations and marry either Elton or David then escape from the Nazis through the Abbey and over the mountains. 3. Did you actually say that the purple skirt was hideous? Even though it's PURPLE?